Grab the kids and get ready for FOOTBALL season! 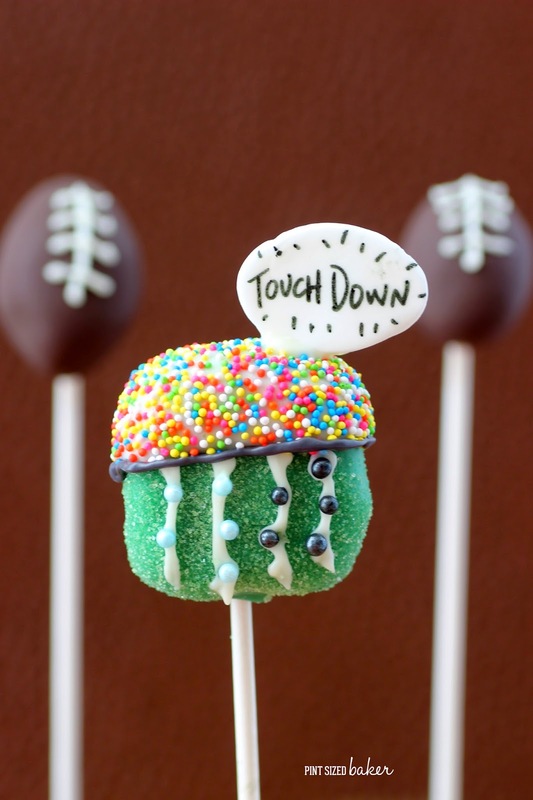 You can follow this football and stadium cake pop tutorial and bring them to the kids pee-wee game or serve them at your Monday Night Football Game party! 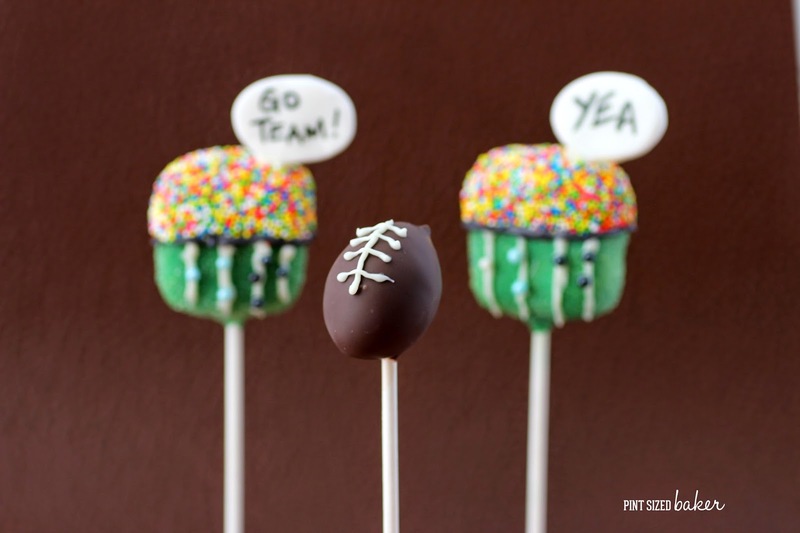 I’m sure that whoever you are routing for these football and stadium cake pops are sure to be a crowd pleaser at half time! They are pretty easy to make and my kid loved making them with me! The footballs are pretty straight forward. 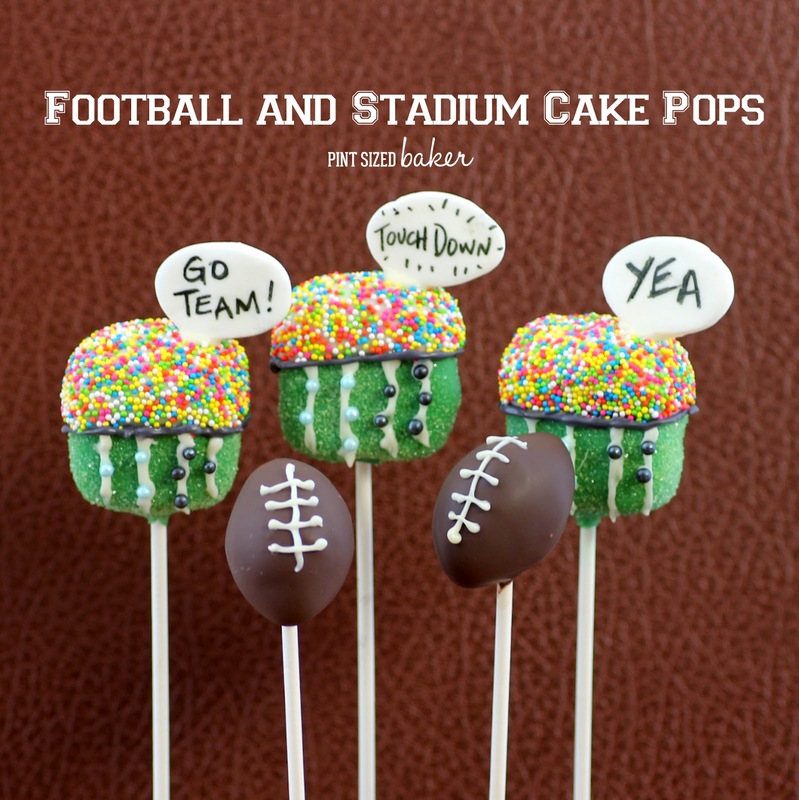 Make your cake pop batter and shape them into football shapes. Dip them into chocolate and let them dry. Then add white for the laces and you’re done. 1. Shape 1.5 tablespoons of cake pop batter into a square shape. Don’t make a cube, you want it to be thinner than wider. Just don’t make it so thin that the stick will poke through. I didn’t measure, but I’d say my squares were about 1 inch wide by 1/2 inch thick. Place them on a cookie sheet lines with waxed paper, cover with waxed paper and refrigerate. 2. 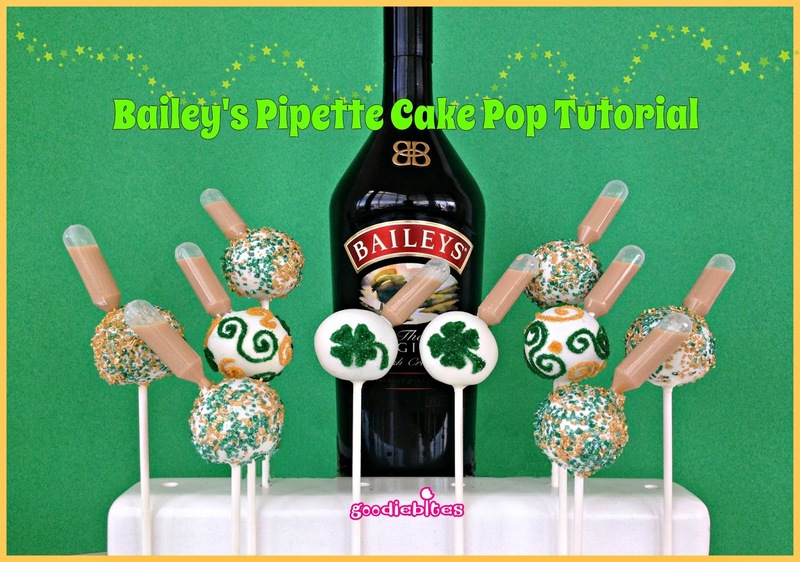 Gather your sprinkles (green pastel sanding sugar , rainbow nonpareils , and sugar pearl sprinkles ), lollipop sticks and decorations . 3. Melt some green candy melts. 1 minute in the microwave in a ceramic mug, give them a stir, then 45 seconds at 70% power and stir until completely melted. 4. Dip 1/4 inch of the lollipop stick into the green candy then insert it 3/4 of the way into the cake pop square. Complete adding all the sticks to the pops. Dip the pops completely, straight down and back up again. These are heavier so be gentle with them. Carefully tap off the excess candy with the pop hanging down then sprinkle on some green sugar sprinkles to give the look of AstroTurf to the lower half of the pop. Stand up the pop to dry. Complete dipping all the pops. 5. Melt white candy. Dip the dry cake pops straight down to cover the top half of the green. Carefully tap off the excess candy and add the rainbow nonpareils. Stand and let dry. 6. Add the details for the stadium, yard-lines and “players” on the field. 7. Once the pops are dry, use a sharp knife to carve out a small divot from the top of the pop. Write your message in the word bubble and attach with some melted white candy. Check out my little video that I made while making the pops with my kiddo! You’ll find out who I’m cheering on this year! 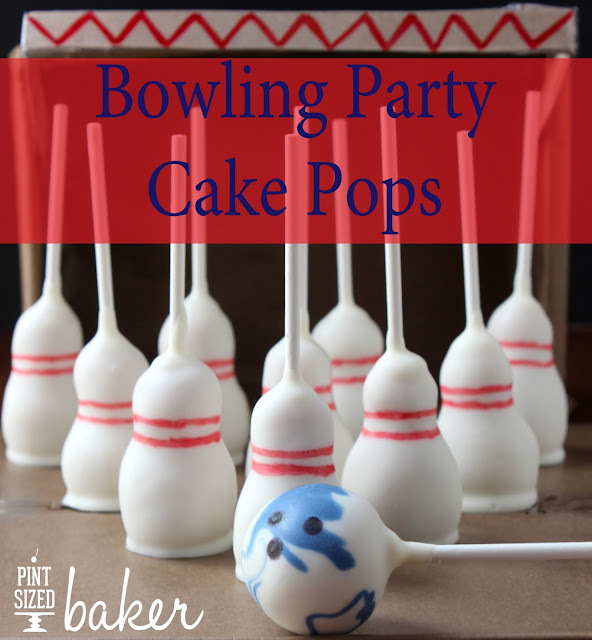 For more sports themed Cake Pops, check out these tutorials!